The big environmental news in America over the past few weeks is the massive poisoning of the local water supply in Flint, Michigan. This has been going on for years, and the water is seriously contaminated with lead, even in the local hospitals. The authorities did absolutely nothing, and continued to ignore the problem despite coverage from the local press. After about a year, the story’s managed to get through to the national American media, and it’s became a major scandal. This is another scandal involving the poisoning of a people’s water supply, but it’s one that hasn’t made the news yet. 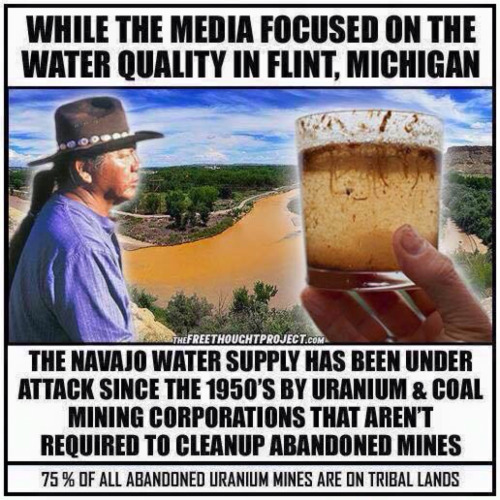 It’s the contamination of the water supply of the Navajo First Nation by abandoned uranium and coal mines. The meme states that 75 per cent of all abandoned uranium mines are on tribal lands, which might indicate that other Native American peoples are affected. Now this is very much an American issue, but it’s also part of what’s happening globally. Way back in the 1980s the Telegraph over here was moaning about how environmentalists weren’t letting the uranium mining corporations dig out the fuel from Aboriginal tribal lands in Oz. I’ve got a feeling there’s still a scandal and controversy going on about it, which centres around proper payment for the Aboriginal owners and clean-up operations afterwards. I have a feeling – though I don’t know – that the same is being done to the Aboriginals Down Under. Their land is being trashed, and not cleaned up afterwards. And I have a horrible feeling that some of those corporate vultures involved may be British, or will want to come to Britain to do the same thing to our Green and Pleasant Land. If they aren’t doing it already, thanks to Bliar and Cameron. One of the companies that poisoned another Amerindian people’s land decades ago certainly was. Way back in the 1980s the Hanson Trust was in the Sunday Express. It was being sued by the Sioux, because their cement works was polluting their reservation. And this didn’t surprise me at all. Lord Hanson was an asset-stripper, who bought up other companies, only to strip them and sell them off at a profit, before going on to carve up the next one. He was the Thatcherite dream. And he did it to W.H. and H.O. Wills in Bristol. Wills were a booze and cigarettes combine. They had several tobacco factories in Bristol, one of which was a huge construction that was used as a location in the Tom Baker Dr Who story, ‘The Sunmakers’. They also owned Courage’s brewery in the centre of the city. These both went their separate ways when Hanson got hold of them. And he also tried to get his mitts, Maxwell-like, on the company’s pension fund. However, he found the pensioners’ lawyers were too good for him, and ended up selling the company off a few years later. Although that kind of corporate theft is associated with Robert Maxwell’s looting of the Mirror pension fund, the legislation that allowed it was Tory. It was passed by one Margaret Thatcher. You could also tell how grotty the Hanson Trust was because they also launched a PR campaign on TV. This bent your ear about how many times the plastic chairs they made would go around the world, if you lined them up one by one. It ended with the slogan ‘A company from over here, doing rather well over there’. ‘Over there’ meaning America. Well, God help our American cousins. Ben Elton recognised what they were and sent them up as the archetypal nasty corporation in his stand-up tour, Motorvation. It doesn’t matter what colour the ordinary man or woman’s skin is to these vultures, whether your White, Black, Asian, Amerindian, whatever – companies like the Hanson Trust just loot, pollute and move on. They’re everywhere, and we need to stand up to them, no matter where in the world they’re operating. Because if the do it to one of us, they’ll do it to all of us. If you want to see the original, it’s on the over 18 Tumblr site, 1000 Natural shocks at http://greybeard55.tumblr.com/image/138997619025. Beyond the affect on the Navajo people’s own health, and the global politics of the situation, there’s also the issue of the destruction of the ancient heritage of the American people as a whole. The Navajo reservation contains some of the most stunning and beautiful scenery in the US. The sand paintings made by the tribal shamans during their healing ceremonies are highly regarded by art connoisseurs. And the area possesses some of the most enigmatic and fascinating indigenous American archaeology in the US. From the 12th to 14th centuries AD the area was the centre of several highly developed civilisations. They built brick fortress cities high up in caves in the canyon walls, and a system of irrigation canals. They also had a peculiar system of roads. These appear to have been cut straight through the landscape, like the Romans. They also made them double, so that there was a pair of roads running parallel to the same destination. No-one quite understands why, though it’s thought that there might be some ideological or religious reason for it. I also think that, like many of the other Native American civilisations in the South West, they had extensive trade contacts with Mexico and the great civilisations there, such as the Aztecs. But it’s another mystery how those trade systems operated. Mesoamerican goods and motifs appear in the remains of the peoples of the Southwestern US, but they don’t appear in the material record of the peoples in between. What was going on? Why not? How were these items traded, and why? And the history of the area also bears witness to the devastation caused by climate change. Many of the civilisations in what is now the Navajo reservation vanished in the 14th century as drought finally dried up their water supplies, and they were forced to move out of the area. Their cities and crops were abandoned. Now there’s a lesson relevant to today, and the contemporary crisis surrounding climate change and global warming. There are still many unanswered questions, and vital lessons to be learned from the Navajo and similar peoples. The poisoning of them, and the destruction of their land are an attack both on their people and civilisation, and that of the wider American people. And needless to say, they and the people of Flint, deserve better. Mr Meacher supports his claims by laying out a wealth of evidence that, while the comedy PM crows on and on about Labour’s (non-existent) pandering to the unions, “there is almost nothing… that Cameron won’t do, no commercial interest he will disdain, no policy he will refuse to alter if it will ingratiate himself with the sources of money and power… He has prostrated himself before a wide range of commercial interests by changing government policy to suit them in order to recruit their money and power for himself and his party in the lead-up to 2015″. Mike and Michael Meacher then provide the proof in various policies Cameron has adopted due to lobbying from different companies. Now I have to say that I think political parties, through forging links with private industry and think tanks, are rapidly changing from institutions of government above the organisations, corporations and social groups they regulate, into power brokers, whose role is to allow these private interests access to governmental power. If you look at all three parties, including New Labour, their conferences are sponsored by industries and corporations. Their leading members frequently have careers in those corporations, or use staff on secondment from them, and the policies they enact have been drawn up by those very same companies. The only role the parties have is to choose which parties they will favour, and provide a democratic front for policies that have been formulated in private by private companies or associated think tanks in their own interest. Now there has always been corruption and influence peddling in politics. American politics is notorious for the way a big corporation, which sponsor a politico’s election campaign all the while expecting him to return the favour once in office. Under New Labour and the Coalition, however, this type of corruption has become institutionalised. Private industry has supplied legions of Special Advisors, in opposition to the Civil Service, which traditionally had the duty to supply ministers with suggestions for future policy. As for what can be done about, a good start would be listing, which MPs have connections to which companies, and how they have voted in these companies’ favour. Private Eye did this during Major’s government, when he did his best to put off any legislation against the tobacco and alcohol industries. David Cameron has been in the news the last few days for his attempts to block legislation requiring that cigarettes be sold in plain packages, as has been suggested in Australia. Central to this campaign is one of the Tories’ spin doctors, Lynton Crosby, who is part of the Crosby Textor Aussie lobbying firm that works for the tobacco industry. Unfortunately, this is pretty much par for the course for the Conservatives, who have long running connections to the tobacco and alcohol industries. During Major’s administration his economics expert, Alan Clarke, took up a position with British American Tobacco. Private Eye, with their usual wit and bile, sent him up as BATMan, a parody of the superhero strip. This featured Clarke as BatMan, hurtling around in his BATmobile, shaped like a giant cigarette, combatting the evil forces of the anti-smoking lobby and forcing Third World children to take up smoking. He was rather like an overweight, middle-aged Nick O’tine, if you can remember that anti-smoking advert from all those years ago. So, as with so many of the Tories’ policies, no change there then.